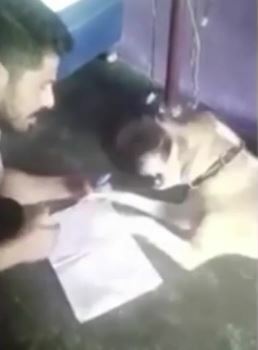 A horrifying video has surfaced online which captures the moment a man beats a dog repeatedly for not being able to learn the alphabet. 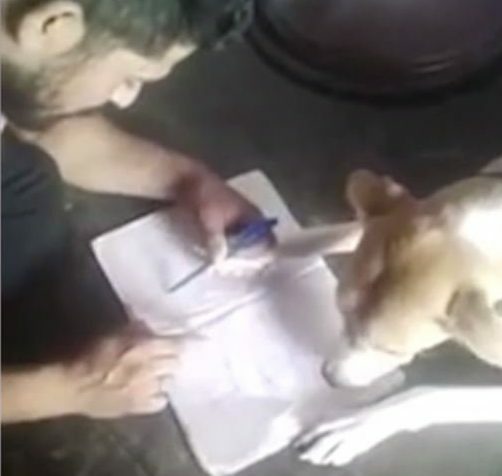 It’s not clear why the cruel man is attempting to teach the dog to recite the ABC’s, but the video clearly shows him hit the confused dog multiple times when it can’t complete the obviously impossible task. He repeatedly hits the dog in the jaw as the dog bares its teeth, the man hurls abuse at the animal as he physically abuses it. 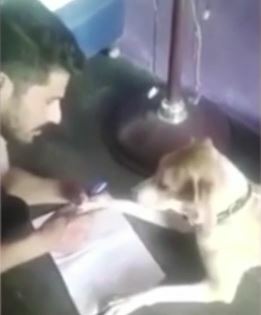 All the while, the man is holding one of the dog’s paws with a pencil in it to try and teach the dog to write ‘ABCD’. It gets even worse when the dog looks away for a moment when the man unleashes a flurry of attacks on the poor thing. Despite the dog baring its teeth, the man is not deterred and continues to abuse the defenseless animal. The video first appeared on social media in India, according to Metro, where people were sharing the clip for being ‘funny’. This man is a coward and a bully who viciously slapped and upset a dog simply to assert his own pathetic idea of dominance. The rise of smartphone technology and social media has given twisted individuals such as this one some fleeting viral fame. PETA urges authorities to use the same technology to ensure that this man’s deliberate and cruel attack on ‘man’s best friend’ sees him charged and convicted under the law before his feelings of inadequacy take an even greater toll. Sadly, a lot of people think it’s funny to share pictures and videos online of animal cruelty and abuse. However, many people are not prepared to accept the things they see online and are quick to report videos like this to organisations, such as the RSPCA, and we applaud them for standing up against animal cruelty. Anyone who is concerned about any animal treatment they’ve seen in England or Wales should call the RSPCA on 0300 1234 999.